Amanda and Paul are proof that opposites attract. Amanda says Paul is an inner child, and she is more organized and considers herself Type A. They both balance each other out and always make each other happy. The pair met at a restaurant where they both worked. They lived together for 4 years beforehand, so getting married felt like the right decision. After looking at local venues and seeing how expensive they were, they chose to host a destination wedding instead. Amanda had goals to travel, and they’ve both always been attracted to the beach, so the idea of taking their loved ones on a trip for their wedding sounded perfect. Amanda began doing research online and quickly became overwhelmed with all the destination wedding information on the internet. Luckily for her Jordan, from Destify, reached out to her, and it turned out to be a great match. “Jordan asked if I had any questions, and I said only a million. She had all the answers I was looking for.” After their first chosen resort didn’t have their desired wedding date, they were able to find another one, which happened to have great rates, the Excellence El Carmen in the Dominican Republic. Amanda admits it was hard to plan with the wedding coordinator solely by email and to be so far away without being able to see everything. In preparation to the wedding, she went to multiple dress fittings and stores. Amanda finally decided on the one she couldn’t quit thinking about. Once she met her coordinator on-site, in Punta Cana, Amanda says she was the friendliest person she had ever met. It put all of her anxieties to rest. Traveling during hurricane Irma and with 25 guests, some flight problems arose, but Jordan was there to help. They held their ceremony on the resort’s beautiful white-sandy beach. 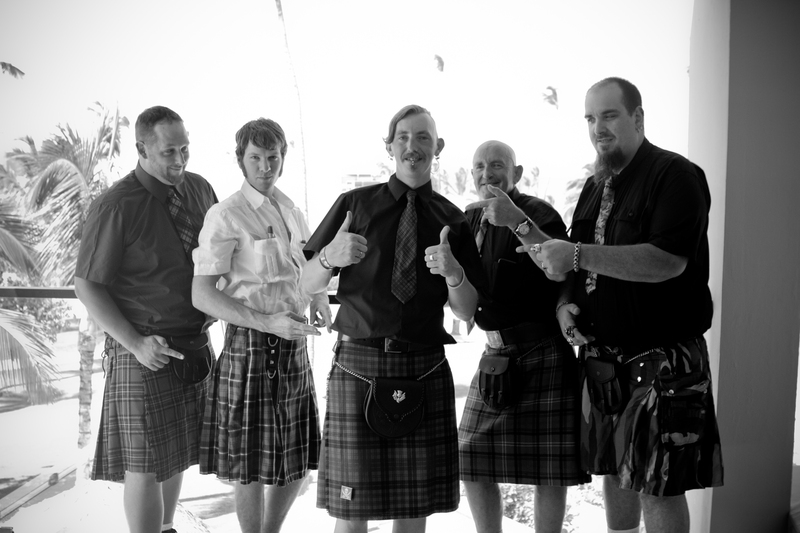 Paul is 100% Scottish, and the groomsmen wore kilts at the ceremony to show pride and follow tradition. The couple stayed for 7 nights in the Dominican Republic, and most of their guests stayed for 3 nights. After the wedding, some of the guests went deep sea fishing the next day. Paul comes from a fishing family, and they were very excited to catch a specific fish on this trip, the “Dorado”, which many of them actually caught and took pictures with. It turned out to be a great bonding experience. The couple got to take advantage of excursions on their own too, even going on a helicopter tour. Amanda was pleased that Jordan was such a great resource for the entire trip, and even after. She can’t imagine having organized her wedding without the help of a travel agent and will be using one for future trips. Although a few days had bouts of tropical rain, the wedding still turned out beautiful, and the pictures prove it. The couple now has the urge to travel again and are ready to vacation even more! It was a once-in-a-lifetime experience and I’m still kind of riding the high.